Conor Stakelum has finished 33rd at his second consecutive European Figure Skating Championships in Minsk, Belarus earlier today. The five-time Irish champion competed in the short programme inside the Minsk Arena and was 11th to skate out of 37 skaters from around Europe. 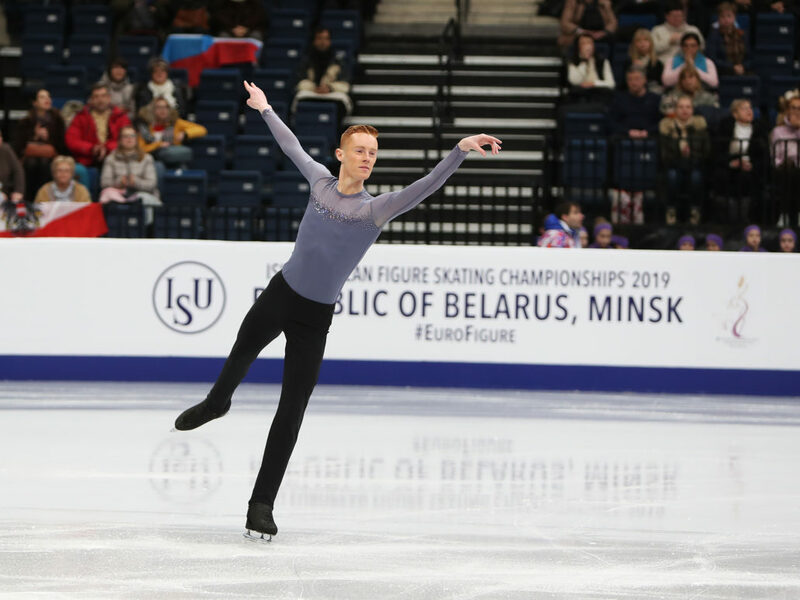 He opened his programme to “Clair de Lune” with a triple loop and triple toe loop-triple toe loop combination which both received positive grades of execution from the panel of nine judges. He also landed a double Axel and received Level 4 for a flying sit spin. The Dubliner earned a score of 55.03 which saw him in 33rd in the standings at the end of today. Although it was not enough to advance to Saturday’s free skating, it was a new International Skating Union (ISU) personal best and an improvement on his 36th place at last year’s Europeans in Moscow, Russia. Full detailed results for the 2019 European Figure Skating Championships can be found here.